Less than 100 tickets are available. Journalists like to think of themselves as presenting as accurate a picture as they can of the real world. The American Association of Petroleum Geologists takes a broader view. It is presenting its annual journalism award this year to Michael Crichton, the science fiction writer whose latest book, "State of Fear," dismisses global warming as a largely imaginary threat embraced by malignant scientists for their own ends. "It is fiction," conceded Larry Nation, communications director for the association. "But it has the absolute ring of truth." That is not the way leading climate scientists see it. When the book was published in 2004, climate experts condemned it as dangerously divorced from reality. Most of these scientists believe human activity, chiefly the burning of fossil fuels, is changing the atmosphere's chemistry in ways that threaten unpredictable, potentially damaging effects. The book is "demonstrably garbage," Stephen H. Schneider, a Stanford climatologist, said in an interview yesterday. Petroleum geologists may like it, he said, but only because "they are ideologically connected to their product, which fills up the gas tanks of Hummers." Daniel P. Schrag, a geochemist who directs the Harvard University Center for the Environment, called the award "a total embarrassment" that he said "reflects the politics of the oil industry and a lack of professionalism" on the association's part. As for the book, he added, "I think it is unfortunate when somebody who has the audience that Crichton has shows such profound ignorance." “Just let me do the talkin’, okay?” said Earl. The banked track Lonestar Rollergirls will skate their third bout of the season this Sunday, February 12th. 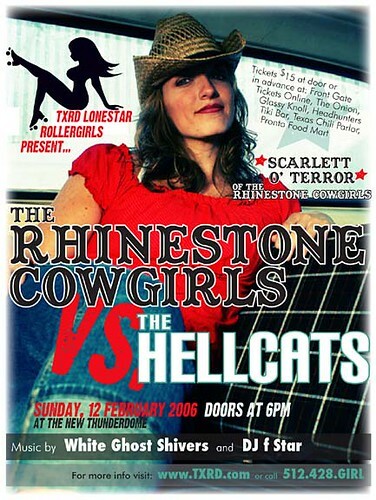 The Hellcats take on the Rhinestone Cowgirls. Songbird, the "open source iTunes killer," flies today. Senator Russ Feingold - "Congress has lost its way"
except with torn fishnet stockings and lethal elbows. Forget about a good nickel cigar. What this country needs is more wholesome family entertainment like Roller Derby. I attended my first Roller Derby event last week and loved it. Loved the action. Loved the girls (yeah, they call themselves "girls"). Loved the crowd. Loved the fact that Roller Derby manages to be simultaneously a serious competition and a huge goof. But what I loved most is that it was a valuable reminder to not clutch too tightly to your stereotypes. 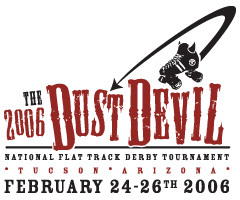 You may remember Roller Derby from another era. Back then, it was stagey and theatrical, sort of like professional wrestling. Some skill and athleticism were on display, but that was subsumed by the choreographed violence and made-up feuds. Let me be blunt about its appeal: It was chicks fighting. That was then. This is now. In the new version of Roller Derby, there's no fighting, no choreography and no preordained victor. There's plenty of violence, but it's of the type you see in football rather than in a bar brawl. Better yet, there's no flavor of exploitation to it. The local two-team league, Carolina Rollergirls, is run by the skaters, for the skaters. The flat track Philly Roller Girls will skate an ehxibition bout on Sunday, February 12th. Millenium Skate World, 1900 Carman St., Camden, NJ. Doors open at 5:30pm, bout at 6:30pm.